Separation of waste: and finally, the last process is in charge of eliminating the particles that were not very well refined by the previous steps. Of course, there may be variations in these procedures, as the goal may be to preserve different active principles. Nevertheless, essentially, the processes can be separated this way. The hemp seed is considered an excellent source for obtaining vegetable protein. Here at home, we use hemp protein in many of our favorite dishes. One of them is the perfect Autumn recipe - Hemp protein powder pancakes. So, we'll share this super easy to make recipe! Mix all the ingredients until a homogeneous consistency is obtained. Place a portion of the dough in a circular shape in a pre-heated, non-stick frying pan. Cover with a lid. When the dough begins to make "bubbles" turn and leave a few seconds, and repeat until the dough looks ready. These amounts give for approximately 4-5 medium-sized pancakes. 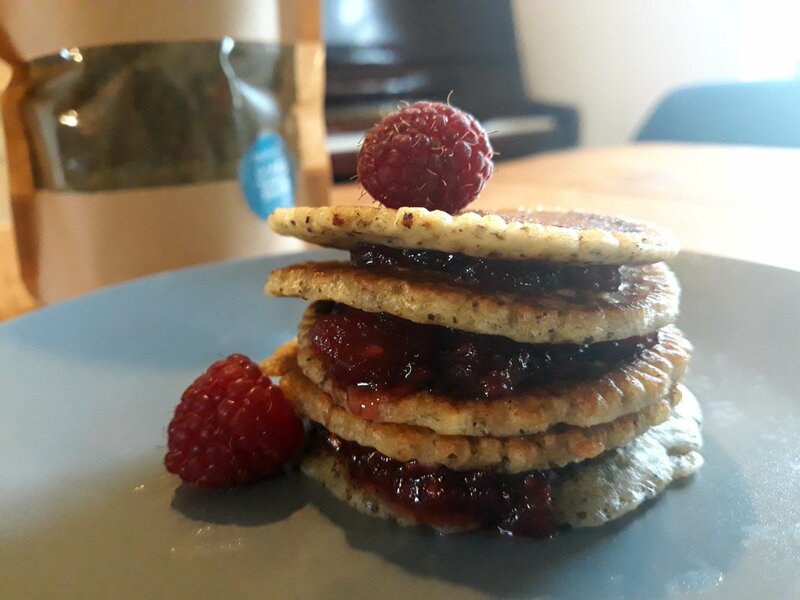 We stuffed our pancakes with a homemade raspberry and apple compote made by ourselves and a couple of hand-picked raspberries from our garden. We hope you try and enjoy it!